Now the house is open to the public and when we visited it and the end of last year cost €8 per person to visit, although children under 12 are allowed in for free. Once inside a tour of the house is marked out so that you work your way around from one level to the other, passing from room to room. 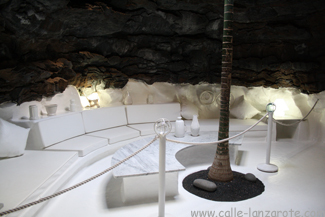 Part of the house was famously built inside lava bubbles, each of which has a different theme. One room has a large window that looks out onto a large field of lava. Others house art collections. 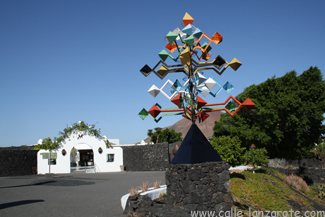 One particularly fascinating collection of sketches shows the windchimes that can be seen across the island, presumably in their design stages. 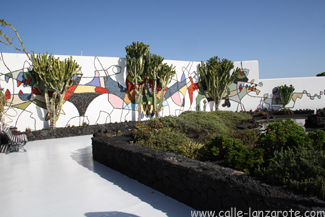 Having been through the house, the tour finishes on the upper level in a garden which is also home to a large mural along its wall. 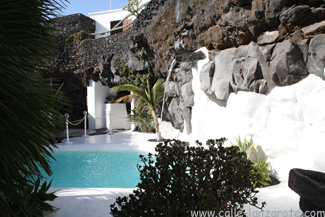 Here there is also a café and souvenir shop, where it is possible to buy a CD of the relaxing music that is played throughout the house. Having heard so much about the house in the past it was interesting to visit it and see it for myself. This entry was posted on Wednesday, June 6th, 2012 at 11:51 pm	and is filed under Museums. You can follow any responses to this entry through the RSS 2.0 feed. You can leave a response, or trackback from your own site.